I plunked my money down on a name brand skin care product that promised nightly renewal with rich vitamins and skin-nutritional ingredients. What did I get? A heavy cream that absorbed quickly, but without any noticeable softness or sign of skin rejuvenation. In fact, after several weeks of use I developed peeling patches on either side of my nose. My skin was dryer than before I used the product! I always keep a jar of organic coconut oil in my pantry. Coconut oil is healthy for cooking, is great for seasoning pans (or as a coating to prevent sticking), and I use it for one more thing – my bulldog’s dry nose. Seriously! I keep a small container of coconut oil in my dog care kit. I apply a small dab to his nose when I routinely clean his folds and ears. I am sure the coconut oil is healthier than the much more expensive petroleum-based salves and ointments made for bully noses. A few weeks ago I dabbed coconut oil on my dry skin patches. It melted luxuriously and immediately felt soothing. Then I applied a small amount to my face, and to my hair as a leave-in overnight conditioner. It left my hair looking oily, but it washed out beautifully the following morning, with a noticeable soft result. 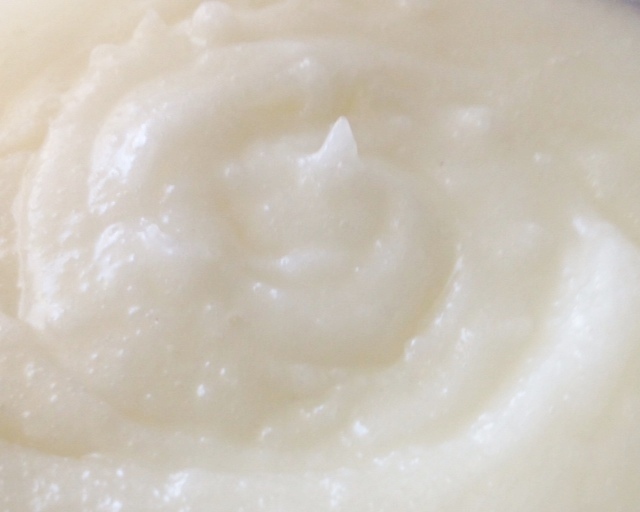 After I experienced a difference in my skin condition, I decided to take it a step further by swirling up (hand stirring) a batch of my own natural coconut oil skin care moisturizer…simple!!! Unfortunately, I did not have Neroli (Citrus aurantium) and Carrot seed (Daucas carota) oils in my possession. Add 1-2 drops each for additional nourishing and anti-aging properties. Store in a clean jar with a tight fitting lid, in a cool area to prevent melting of the product. This formula does leave a healthy glimmer to the skin. It does not create an oil-slicked look and feel, but that also depends upon the dryness of your skin and the amount of moisturizer applied. A small amount is all that is needed. The scent of this formula is not overpowering. I personally cannot tolerate fragrance. I have to cover my nose as I walk through the detergent aisle in a store! I can live with pure unadulterated essential oils…but I cannot tolerate a hint of fragrance. If you are sensitive to fragrance, are you also sensitive to fragrance free products? I am. I believe I am sensitive to the chemicals that are used to mask the ingredient odors, fragrance or not. If this is also your situation, you might consider eliminating fragrance from your life entirely – and go with products that are as natural as possible. Note: When working with essential oils, always test the formula for allergies and sensitivities by applying a small amount to a patch of skin before applying to larger areas. I test for allergic reactions on the soft skin inside my elbow. Some oils are photosensitive, meaning, they can cause an adverse reaction or sensitivity when the skin is exposed to sunlight. Avoid using any skin care products containing these oils (do your research beforehand) if you are going to be exposed to sunlight. I have a foundation level certificate in aromatherapy, I am not a licensed practitioner. I am telling you this because I do not want you to dabble in essential oils without knowing your stuff. Essential oils can be dangerous! Natural does not mean safe! Natural can be toxic, especially when essential oils are either not diluted in a carrier oil (1% is a great start), or if the oils are taken internally. Do not blindly use essential oils on young children, pets, pregnant women, the elderly, or anyone suffering from a health condition! Leave it to trained professionals.